One of the biggest challenges in online marketing is creating unique content that will not only bring users to your website but will also engage those same users on a deeper level. The importance of understanding how to make interactive infographics is starting to rise. Over the years, marketers have taken a variety of approaches to finding and maintaining engagement with their audience. But according to recent reports, use of infographics increased from 50 percent to 58 percent in 2016, outpacing the growth of any other content type for B2B marketing. This sends a clear message: Data visualization is a key component of a successful marketing campaign in the current landscape. What if you could go beyond the static infographic to further increase engagement? With interactive infographics, you can. You’ve probably heard the old saying “A picture is worth a thousand words.” The saying dates back to the early 20th century, but it is truer now than ever. Our brains are wired for images. We are far more likely to understand and remember information if it is presented with engaging visuals. Furthermore, as people become more accustomed to doing the majority of their reading online, infographics provide a way of digesting relatively large amounts of information while reading relatively small amounts of text. Because infographics have become so popular in recent years, it is harder than ever for marketers to stand out in the crowd. However, adding interactive elements to infographics may provide a solution to this problem for marketers looking to be heard above all the noise on the internet. While learning how to make interactive infographics can seem like a daunting task for marketers with limited technical skills, the payoff is worth it. Research indicates that custom and interactive content considerably influences consumer buying decisions, and that interesting interactive content is one of the top reasons that will lead users to follow a brand on social media. With this in mind, it is important that marketers learn how to create interactive infographics to engage users and ultimately increase conversions. I’m Convinced. How Do I Get Started? Any good infographic will start with compelling data and information. This information can come from proprietary data or research that you have conducted yourself, or it can come from a reliable third-party data source. But it’s important to keep in mind that any data you use from sources outside of yourself and your organization should be cited and linked to in your infographic, both to let your users confirm your research and to give proper credit to the source of the information. Do make sure that your data is both reliable and relevant. With the ever-expanding number of infographics online, there has been an explosion of infographics with relatively useless information. If you want your content to stand out, start by making sure that the information that you are providing to your users is quality information that will either interest them or (better yet) help them in some substantial way. I Have My Data. Now What? Once you have collected your data and other compelling information, you need to determine what story you are trying to tell with it. 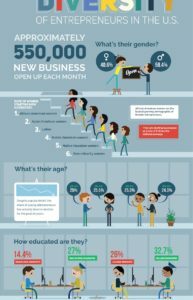 For example, the above infographic began with a bunch of demographic data about entrepreneurs in the U.S.
Notice that the data alone does not tell the story of the infographic. The author of this infographic broke the data down in order to tell a story about diversity among entrepreneurs. It is both a success story and one that makes it clear that we still have a long way to go to achieve diversity goals. This is done by creating a series of questions about entrepreneurship and letting the data paint a clear picture in response. 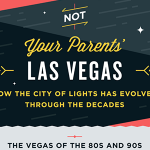 Telling a story in an infographic is akin to “finding an angle” in journalism. It’s about looking past the facts themselves to see the image they will create in the mind of the reader. Include real-world examples of the situations you’re talking about in your infographic to help drive home the data for your users. Use analogies to help the reader to visualize the meaning of the data. Analogies work best when they relate the data to things in the reader’s own life. Include quotes or commentary from leading experts in the industry to lend credibility to your message and bring it to life for your readers. If you already know the data you would like to use and the story you would like to tell but you are having trouble putting it into words, it may be helpful to outsource the writing of your content to experts. Content creators like CopyPress can take your data and turn it into a story that will engage your users and help them understand and buy into your overall message. How Do I Make My Story Visually Appealing? Once you have decided upon the story that you want to tell with your data and information, you need to decide upon a visual theme for the display. The infographic above is colorful, with lots of people to represent the theme of diversity, while the interactive infographic You vs. John Paulson from MahiFX uses a minimalist design with only red, white, and black to create a visual effect that is as shocking and abrasive as the data it presents. 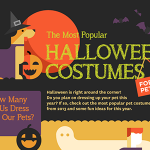 The visual theme of your infographic should enhance the overall message that you are sharing with your user. Depending on your needs, you may also want it to reflect the branding of your company, or you may want to incorporate the visual elements of your blog or website into the design. It may be worth it to you or your company to outsource the graphic design of your infographic if you lack the time or skills to do so in a way that will be visually appealing and meet the marketing demands of your business. A good graphic designer would be able to create a visual theme for your project that would enhance the story you are telling and also incorporate your business branding into the overall design. What About the Interactive Elements? Now that you know that interactive elements will increase engagement with your information, you’re probably wondering how to create interactive infographics that will do just that. There are a number of elements that you can utilize on how to make interactive infographics more appealing. Scrolling animations reward readers who keep scrolling and reading with interesting animated elements. In the Musicmap Infographic, hovers and clicks provide users with increasingly deeper and more specific information the further they delve. Calculators, like the one used in You vs. John Paulson, display information that is specific to the reader. 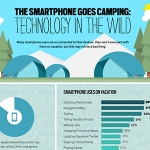 Other infographics may employ tools such as quizzes, surveys, or interactive videos to encourage user participation. Ultimately, the type of interactivity you include should be relevant to the data you’re presenting. If the interactive content doesn’t help the reader to visualize your information in a new or unique way, you should ask yourself whether or not it is worth including. But, I’m Not a Tech Genius. Help! A lot of online marketers are intimidated by the idea of learning how to make interactive infographics because they seem to require not only writing and graphic design talent but also some tech skills to make the interactive elements work. However, there are tons of online tools and resources that can help you learn how to make interactive infographics using your own information and creative ideas. Visme is a cool infographic maker that is created and priced for teachers and students, making it an affordable option for marketers and entrepreneurs, as well. With a huge library full of templates, it allows you to create interactive presentations, infographics, animations, and more. Visme even has a free account you can use to test out their service before committing to the reasonably priced premium account. Another maker of interactive infographics is Tableau Public. Tableau is a free and flexible platform that allows users to create infographics and other data-driven stories. The site is full of resources to help inspire you as well as examples of user-created infographics to help get your own creative juices flowing when you begin visualizing your data. Even with these tools, creating interesting infographics can take some time and effort, so you might also want to consider outsourcing the creation of your infographics. CopyPress offers infographic design services that combine writing, design, and interactive elements to create engaging and educational infographics that will definitely wow your audience. One of the great things about outsourcing the creation of your infographics to experts is that they will be custom-made rather than relying on templates and your limited abilities. In the end, your infographics will look more polished and professional when created by an expert. What the Internet Thinks About is a fascinating infographic by Anna Vital. It displays the internet’s most liked and linked articles in a gorgeous image in the shape of a man’s head. 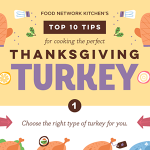 This provides an excellent example of how the visual theme of an infographic should match the content. With each article on the display working as a clickable link that opens up the article in question, it is also a cool example of interactivity. Will a Robot Take Your Job? is an interesting animated infographic that asks users to input their job, then reports the likelihood that the job will be automated within the next two decades. While this infographic from the BBC is a little more text-heavy than most, it provides an excellent example of how interactivity can be personalized and helpful to the user. What the World Eats is a paginated infographic by National Geographic. In a series of 23 animated graphs, the infographic breaks down the calorie consumption of different countries and how the content of the diets in each of those countries has changed over the past fifty years. It is a good example of how a subject that is not particularly interesting can be made appealing through interactive storytelling and graphics. What Is a Limb Worth? is a fascinating (albeit somewhat macabre) interactive infographic that shows the differences between workers’ compensation benefits from state to state. Created by Lena Groeger and Michael Grabell of ProPublica, the infographic consists of a little human for each state, broken up into all of his valuable parts. Users click on their state and then learn the maximum value of benefits for each individual body part in that state. The Enlightened Happy Hour is a completely unique photographic infographic that informs users about the calorie and alcohol content of various adult beverages so that they can make better, more informed decisions during nights out. 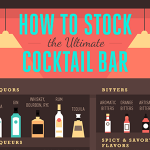 The infographic is highly interactive, with a slick design and high-res photography so that you can easily see how delicious the drinks look before you realize how bad they are for you. The bottom line is that in order to effectively market your company or product, you need to be able to create unique interactive content that engages your users. Interactive infographics allow you to harness the power of both data and visuals into a highly persuasive, often-shared medium that will not only increase traffic but turn that traffic into conversions for your company. You don’t have to create your infographics alone, either! By enlisting the help of professionals, you can ensure that your content is relevant and useful to your audience. CopyPress can help you visualize your data and express it in a useful way.